In the fall, plants stop sending water and minerals up to the leaves. Instead, they will use these nutrients to increase root mass, and to store up food for the winter as well. The changing of the color and dropping of leaves accompanies this phase of the growth cycle. By fertilizing at this time of the year, you allow the shrubs and trees to store up food as it sees fit for next year’s growth. We call this a dormant feeding, since above ground growth has stopped. But underground these plants are not dormant at all. The roots are very active (until the ground freezes) and will grab the fertilizer quickly. You can apply fertilizer much heavier at this stage without fear of leaf burn or flower drop. One of our favorite All-Purpose fertilizers for shrubs and trees is our 10-8-8 Bio-Enhanced Liquid Fertilizer. This contains all the basic nutrients and is good for flowering and non-flowering plants and trees alike. If you are fertilizing mostly evergreens or non-flowering trees or plants you could also use our All-In-One for LAWNS (a 14-3-7 fertilizer) if you have some extra to spare. The beneficial root fungus (mycorrhizae) in All-In-One for LAWNS is especially great for shrubs and trees this time of year. Here is a good illustration of where to water, which is the same as where you would want to fertilize a tree. Make sure to fertilize both inside as well as slightly beyond the drip line, or canopy line, of dense shrubs or trees. There are a lot of feeder roots there. But do not soak the area right near the trunk of a tree. It can cause rot, and there are no feeder roots in that area anyway. Note: do not fertilize at the rates below if the soil is dry. Either wait for a rain, water beforehand, or cut the amount per gallon in half to dilute the fertilizer concentration. For Shrubs: Drench the soil around the root area with 4-5 oz liquid fertilizer per average size shrub (approximately a 2½ foot diameter plant). Increase amount proportionately for larger plants and decrease for smaller plants. We recommend using a hose-end sprayer set at 4-6 oz per gallon of water or use a watering can at the same rate.If fertilizing beds of plants close together where roots are going to be mingled, apply 2- 3 quarts per 1000 sf of bed. 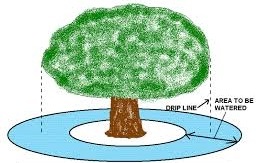 For Trees: Use 4 oz liquid fertilizer for every inch of diameter of trunk at chest height. If some of the roots are under driveways or walks, or trees are close to buildings then apply heavier to the areas that can be treated, perhaps 6 oz per inch of diameter. Water in for a few minutes if fertilizing over a lawn area. Hint: Add some Aerify PLUS or Nature’s Magic to your liquid fertilizer to help improve the soil while fertilizing. If you have any questions at all, just email us, and we would be happy to help!